TSSPDCL Answer Key paper download Telangana government/ TS SPDCL has successfully finished on 22/11/2015. Candidates who are completed TSSPDCL they all are waiting for Answer Key Paper. 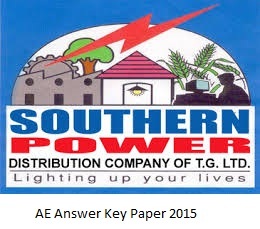 Here we are sharing TSSPDCL AE Answer Key collected from Eenadupratibha and sakshieducation. Below are the details of TSSPDCL Answer Key 2015. The Gentleman’s Agreement was signed between Telangana and Andhra leaders in the year? Who was the last NIzam reler of the erstwhile Hyderabad state? Boddemma festival indicates the ending of? Windows explorer is a program used to? What is the full form of ICRISAT? Which of the fallowing countries does not have a boundary with India? Which of the fallowing is also known as laughing gas?